Finely chop half the dried apricots and the half the tomato and place in a blender with the brandy, vinegar, olive oil, thyme and a generous helping of pepper. 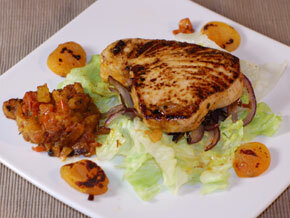 Blend the ingredients together and marinate the tuna in the sauce for 30 minutes at room temperature. If marinating for longer then keep the tuna in the fridge until 30 minutes before cooking. When the tuna is sufficiently marinated, slice the onion into strips and lightly fry for 2 minutes. Slice the remainder of the tomato and fry together with the remaining apricots for a further minute. Layer the onions on a bed of washed lettuce and arrange the apricots and tomatoes. Use a spatula to clear the fish of the marinate and then fry both the tuna and the marinate in the same pan as shown. I prefer my steak slightly rare in the middle and to achieve this you should cook the steak for a strict 2 minutes on each side. Be warned that this cooking method does not guarantee that bacteria in the fish has been killed. If this concerns you then cook it for 3 minutes on each.